This module can be combined with the other SHSM modules to save time and cost. The INFECTION CONTROL module teaches skills to minimize disease transmission through effective disinfection techniques and use of barrier devices. The AED module teaches how an AED works, how to properly use the device through discussion, demonstration and simulations. The HEALTH & SAFETY module teaches basic responsibilities and rights of workers, Regulations, Acts and other work safety guidelines. The OXYGEN THERAPY & RESPIRATORY EMERGENCIES component teaches recognition and treatment of respiratory conditions including COPD and Hypoxia, Safe handling and use of oxygen tanks, administering O2, and the use of suction devices. Any of the following certifications may be taken alone or combined with any other school course. The Wilderness First Aid Course was created by those who took trips in remote areas and found out that the regularly taught first aid courses did not train them for what could be expected in the forest or mountains they were visiting. And, therefore, a group of physicians from the Wilderness Medical Society, created a set of practice guidelines, providing the framework for Wilderness First Aid courses. 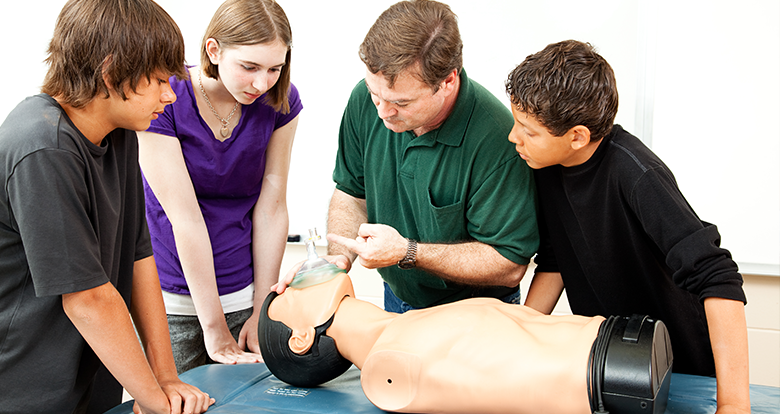 *When combined with Course 3: Standard First Aid with CPR ‘C’, the Wilderness First Aid Course can be completed in 1 day. Understand the effect of falling from heights, including maximum arresting forces acting on the body, purposes and limitations of shock absorbers, and the difference between a swing fall and a free fall. The course may be taught anywhere/anytime. However, we would prefer to teach this course onsite so we can get into more site specific training. We will look at your current rescue plan ensuring all workers involved are aware of their roles and responsibilities while giving recommendations where needed. We prefer to teach these courses onsite OR we can put together a site that has the structures necessary to adequately complete the training. Target Audience: Anyone who works within a confined space, health and safety representatives, safety officers and consultants. Evaluate current rescue plan and make recommendations where needed. Specialty Certification 6: Confined Space Level 1 (Awareness) as outlined above. Students will become confident writing rescue plans and understanding their roles and responsibilities. Having a spill prevention plan in place is among the most effective and efficient tools in preventing environmental contamination. Our training program will discuss spill-related pollution, spill prevention techniques, appropriate policies/procedures for controlling a spill in the event that one occurs, and an introduction to equipment that is used in today’s industry to effectively contain a spill. We will also discuss the difference between a major and minor spill and the impact that it will have on personal and environment. We will make reference to both WHMIS and TDG. The Working at Heights Training Program Standard has a modular format to allow for core theory training to be completed separately from practical training elements. Both the Working at Heights Basic Theory module and the Working at Heights Practical Equipment Module are becoming mandatory for workers in the construction industry who use travel restraint systems, fall arrest systems or safety nets as a source of protection against fall hazards. This particular course has not yet been mandated or approved as the official Ministry of Labor course as the NEW standard has yet to be officially released. All workers will be given adequate time to receive the training in order to meet industry standard. An introduction to personal fall protection equipment.